We Bake Our Rolls Fresh! Finding a classic sandwich in Philadelphia isn't hard to do. But what if you want more? Imagine sitting down in a sports-loving restaurant and biting into a succulent hoagie, cheesesteak, or grinder. 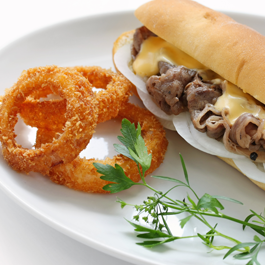 The tender slices of meat tucked inside freshly-made bread can make anyone crave for more. At Fresh Works of Mayfair you will get exactly that, and our sandwiches are only the beginning. Whether you're in the mood for beef, pork, chicken, or even a vegetarian sandwich, we have you covered. Our wide selection of delicious bites appeals to even the pickiest eaters. 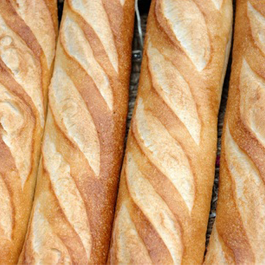 When you walk into our shop, the aroma of our freshly-baked bread is sure to get your stomach rumbling. When you want something other than a sandwich; try our delectable salads or incredible wings, which are prepared with homemade sauces. How about a tortizza or a milkshake? 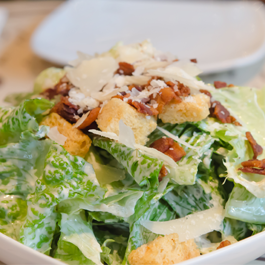 Our mouthwatering selection also provides you with the perfect complementing side for any meal. We truly have something for everyone. When you begin to plan your next big event, turn to Fresh Works of Mayfair. Our catering menu is filled with a variety of our most popular dishes, perfect for corporate, schools, athletic events or any special gathering. Four-foot hoagies, bruschetta, and salads are sure to have your guests returning for seconds. Watch Philly sports on one of our two televisions. Monday - Thursday, 10:00 a.m. - 10:00 p.m.
Friday - Saturday, 10:00 a.m. - 11:00 p.m.
Sunday, 11:00 a.m. - 9:00 p.m.